We'd like to thank everyone that came out to Famous Faces and Funnies to watch the recording of the show! We apologize for not being able to go live from the location - We're working on it! A special thanks to Fawad Siddiqui for making it up from Miami to join the show and to Rick Shea for joining the panel and allowing us to record at his awesome comic shop! As you know we took to our social media sites asking people to tell us their thoughts and experiences regarding the man of steel and we were going to give a prize to our favorite comment. Well the winning comment goes to a user over on Google+ - HAROLD HIRSCH with the following comment: "Superman is a fantasy character (no, I don't mean merely fictional). He's literally the reader's wish fulfillment power fantasy, always righting wrongs and defending the weak. He is the individual that we imagine we could be, always self-assured and up to the task, even when feigning weakness and insecurity in the guise of Clark Kent. Where Batman is a revenge fantasy, Superman is a proactive protector. He is much more likely to prevent wrongs and disasters rather than having to avenge them after the fact. Starting in the late 30's with Jerry Siegel and Joe Shuster's dreams of justice, manifested in taking down slumlords, wife beaters, swindlers and the like. Through WWII acting as America's dream proxy laughing in the face of the Axis threat. Even after the war, as his enemies got more powerful, and he became sort of an agent of the established order, Superman remained our ideal of humanity (though ironically, technically not human). His alien origin makes him genetically superior, and he's graced with a sure sense of right and wrong from his heartland Kansas upbringing. Physically and ethically he is the perfection we aspire to. In short, Superman is the idealized archetype of the hero inside us all." 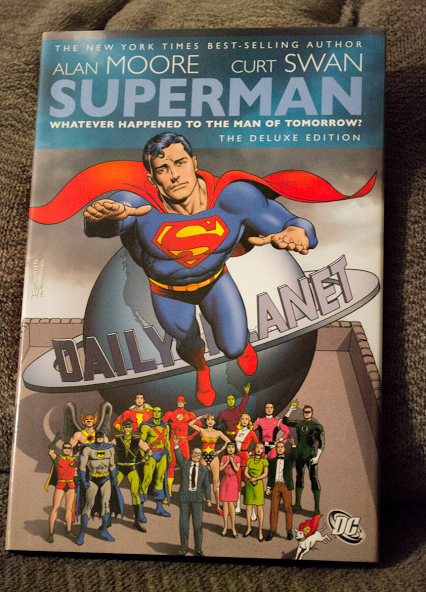 We'll be sending Harold a copy of "Superman: Whatever Happened to the Man of Tomorrow? - Deluxe Edition" (pictured below) courtesy of our host venue Famous Faces & Funnies!